OK, Let’s play a little word association game! I’m a psychologist, we love these sorts of games. Oh, come on, don’t be shy. I promise I won’t analyze your answer. Ready? 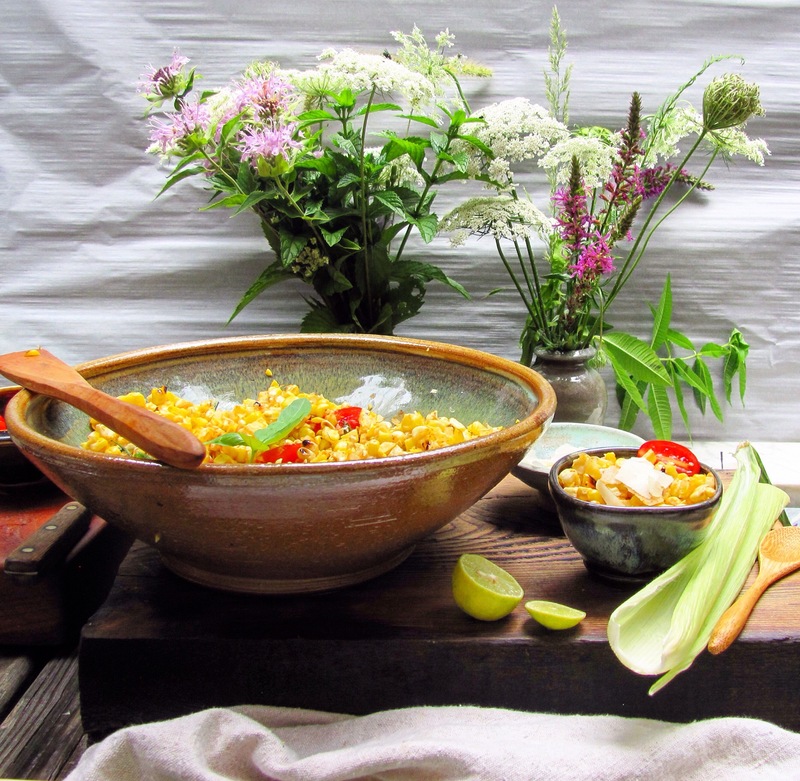 Say the first two words that come into your mind when I give the following prompt: Summer food. What did you say? 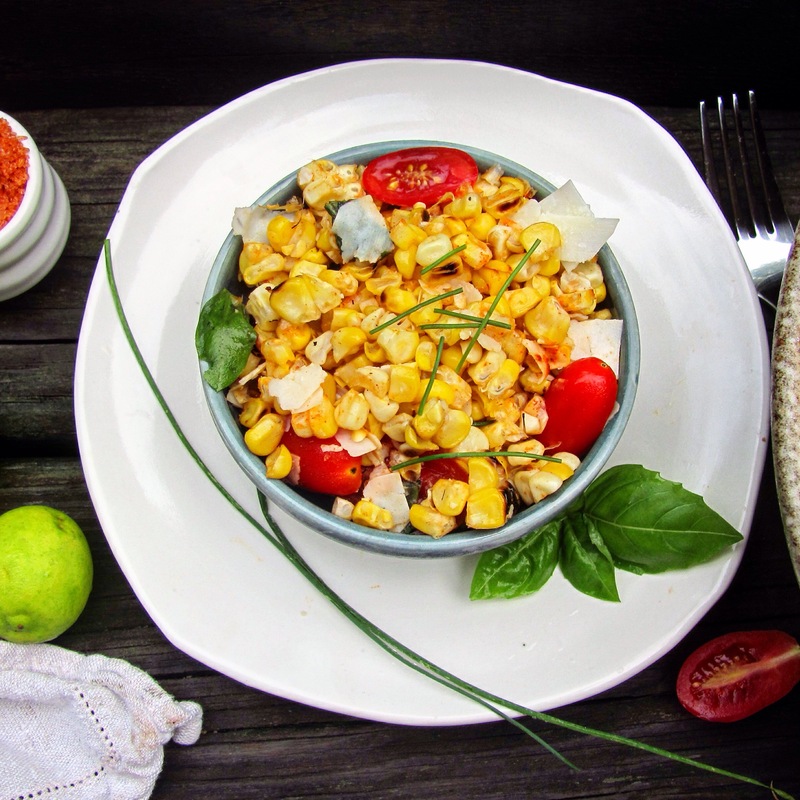 Corn and tomatoes? Me, too! I put both on the table most nights as soon as they are in the market. It’s hard to beat a ripe, summer tomato, simply sliced and sprinkled with a bit of coarse salt and maybe a torn leaf of basil. 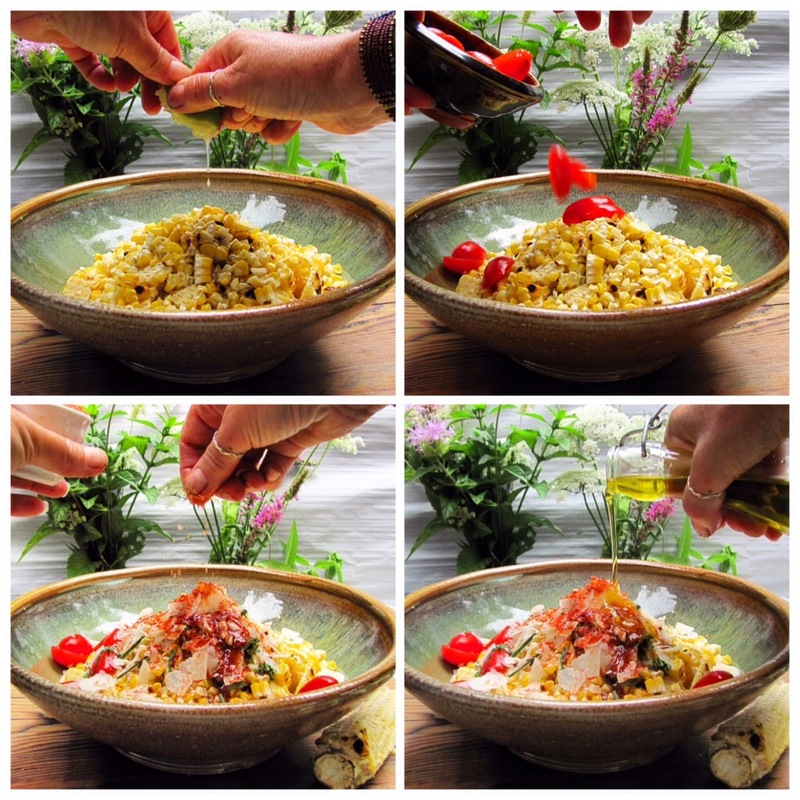 A little good olive oil never hurt, either. 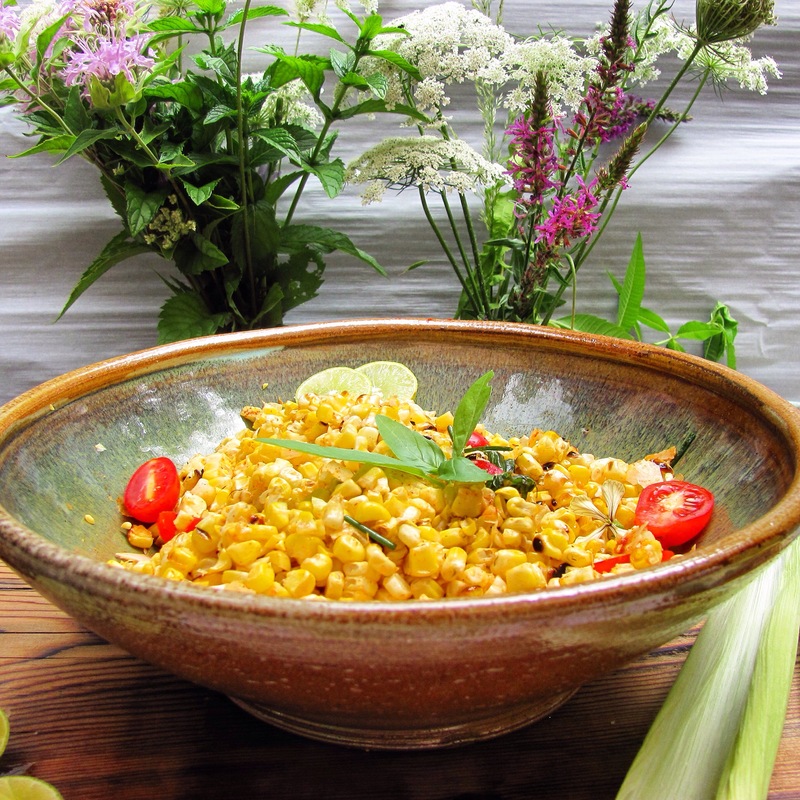 Corn, simply steamed with butter, may be one of life’s finest pleasures. When I’m grilling, I skip the big pot of boiling water and throw a few ears on the fire. Read on and I’ll tell you how. 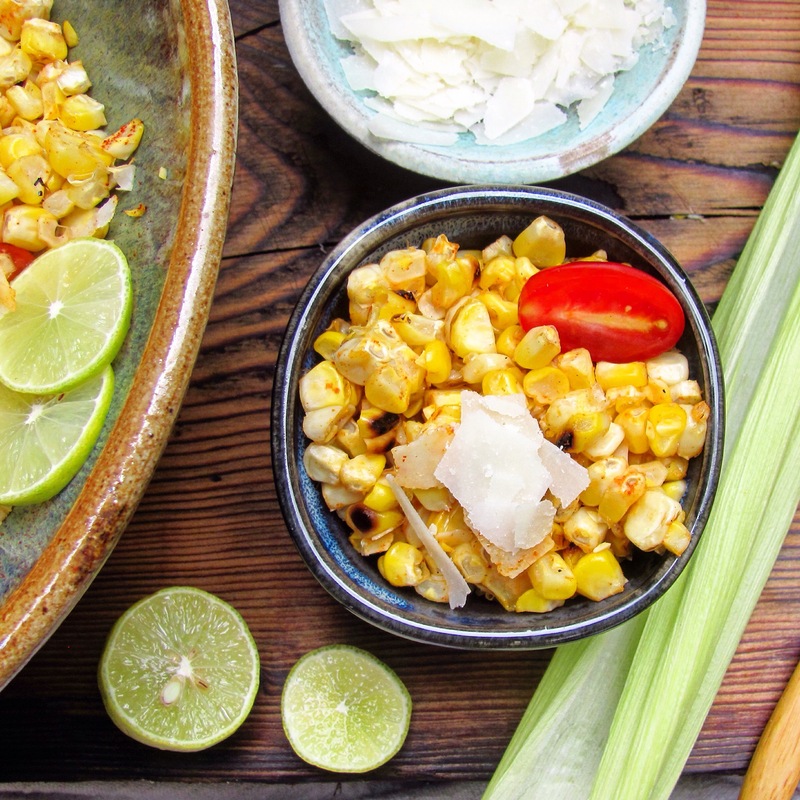 I’m also a huge fan of what our family calls “Mexican Corn,” or “Elote.” I do a number of different versions, but the basic gist involves grilling whole ears, brushing them with mayo and/or sour cream, sprinkling with chili and lime, and then rolling in some kind of sharpish cheese. By now you know that I lie awake at night thinking about food and trying out different combinations in my head. 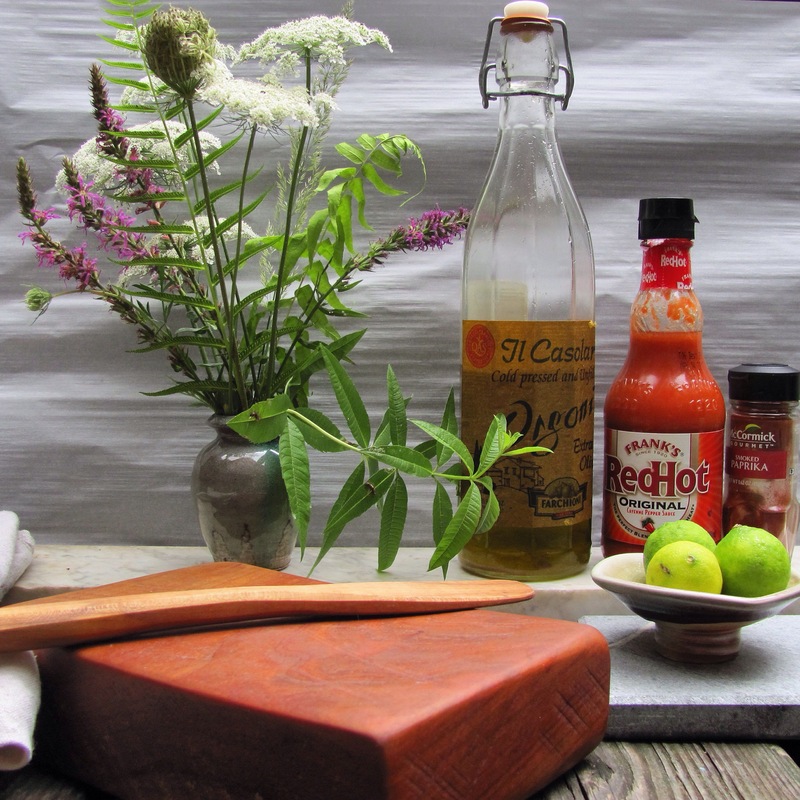 So, I was considering your answer to my psychological test and trying to figure out a way to make one dish with all the flavors of our summer favorites. And this salad is the solution! It hits all the right notes: sweet, salty, sour, and spicy. 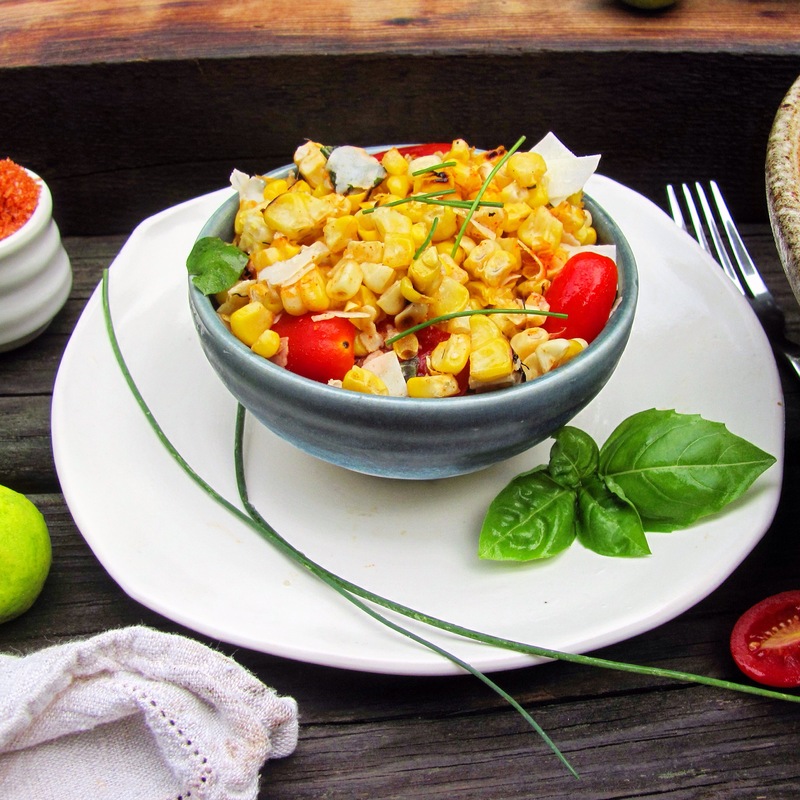 You get tomatoes with basil and Mexican Corn all in one bite and it is a very, very happy experience! If you want to make this vegan, skip the cheese. 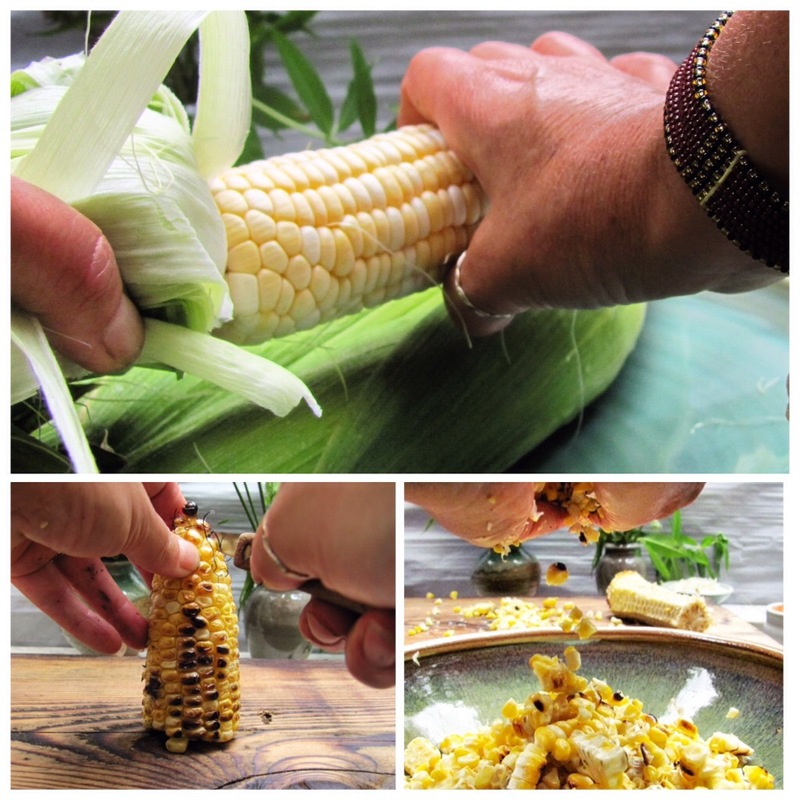 Shuck the corn while you fire up or preheat the grill. When the grill is hot (and clean), place the ears on the grate. Cover the grill and cook for 10 minutes or so, rotating them so that all sides get some nice char. If you have a gas grill, turn it off at this point. Let the corn stand for 5-10 minutes while the grill cools down. This gives the corn a chance to finish cooking through. If your grill is charcoal, take the ears off and wrap them in foil for 10 minutes to let the residual heat work on them. Now, let them stand for 10-20 minutes until you feel you can handle them. Now, I am going to tell you how best to get the corn off the cob. Get a big board. Break each ear in half so the falling niblets have less distance to travel and thus won’t bounce as much. Stand each half ear on end and cut off the kernels with a paring knife. That’s right, not a big knife, a little one. Again, less bouncing. Then, put all your nicely cut corn into a big bowl. Add all the other ingredients and toss to combine. This is great warm right after you put it together. It’s also wonderful if you make it ahead and refrigerate or if you have leftovers. 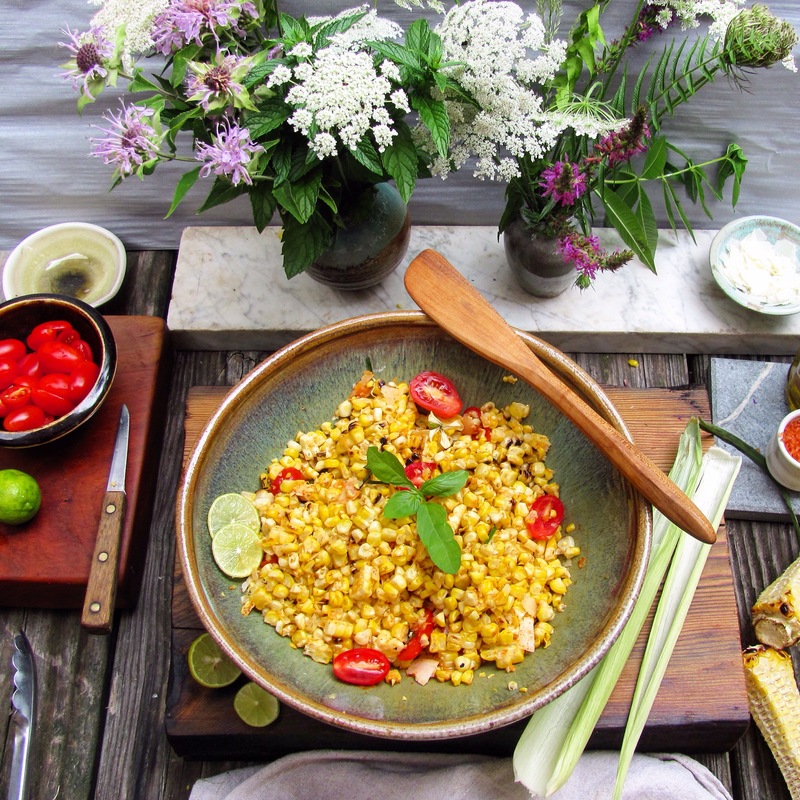 This entry was posted in appetizer, side dish, vegan, vegetarian and tagged barbecue, corn, elote, farm market, gluten free, grill, grilled corn, grilling, mexican corn, parmesan, pottery, psychologist, summer, tomatoes. Bookmark the permalink. Yum! 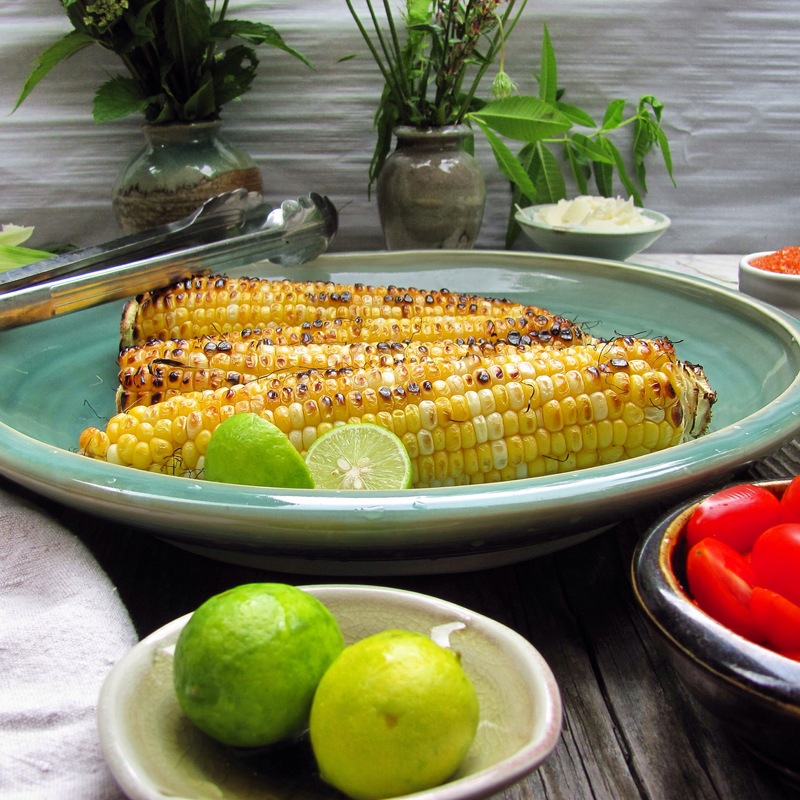 I grilled corn like this last night and added it to a tomato and mozzarella salad. It was so good! The grilled corn was very sweet. Thanks for sharing!